This key lime cake is the ultimate summer party cake. It's pummeled with crunchy toasted coconut and boasts the juice from 5 limes. Toast coconut at 350˚F in a small baking pan in oven, stirring a few times, especially towards the end, until golden and dry, 7 to 10 minutes. Set aside to cool. Make 4-Ingredient Sponge Cake and set aside to cool. Get the recipe on natashaskitchen.com and be sure to watch the video tutorial. In the bowl of your mixer fitted with whisk attachment, beat together cream cheese and 1 cup sugar on high speed 3 minutes until whipped, scraping down the bowl as needed. Beat in 16 oz cold sour cream until smooth (1 min on high). Add lime zest and juice and beat to combine (1 minute on high). Refrigerate frosting if not using right away. In a measuring cup, combine 1/4 cup fresh lime juice, 3/4 cup warm water and 3 Tbsp sugar. Stir to dissolve the sugar and set aside. Slice cake layers in half with a serrated knife. Place the first layer, cut-side-up on a cake platter. Brush with 1/4 of the lime syrup. Top with a generous amount of cream. Repeat with remaining cake layers then cover the entire cake with remaining cream. Cover the entire cake generously with toasted and cooled coconut flakes, using your hands to scoop coconut onto the sides, pressing gently to adhere. 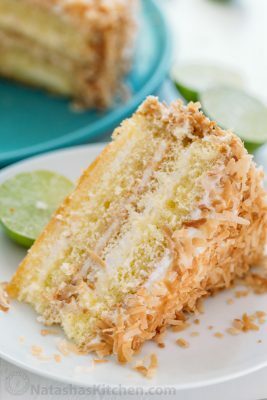 The coconut flakes are crispiest if served right away but it is easier to slice the cake once it's had a chance to set in the refrigerator for about 2 hours. Cake can be covered and refrigerated up to a week. I've also frozen portions of it then thawed with great results - I loved it still partially frozen.